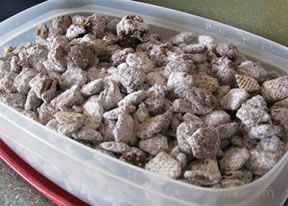 Just when you think puppy chow can't get any better, you figure out a way for it to taste like cake batter! Kids of all ages will enjoy this sweet treat. 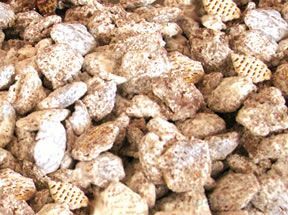 Make this instead of the chocolate peanut butter puppy chow your used to. Pour cereal into a large bowl. Melt almond bark according to the package directions. 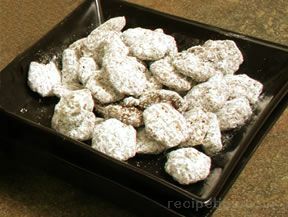 In a large bag, put cake mix and powdered sugar and shake to mix evenly. Pour the cereal mixture into the bag. 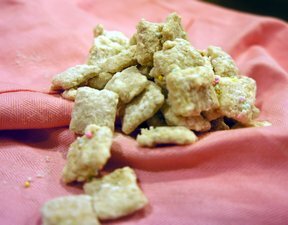 Seal and shake until all the cereal is coated with the powdered mixture. Discard excess powder. "My new favorite! Next time I'll skip the sprinkles, not a fan, and I think they are just for looks."